•John Hancock Sports & Fitness Expo: Head across Seaport Boulevard from the Seaport Hotel and pop into the annual Boston Marathon expo. If you’re one of the more than 30,000 entrants in the 122nd Boston Marathon, this is where you go to pick up your bib for race day and kick off the weekend. 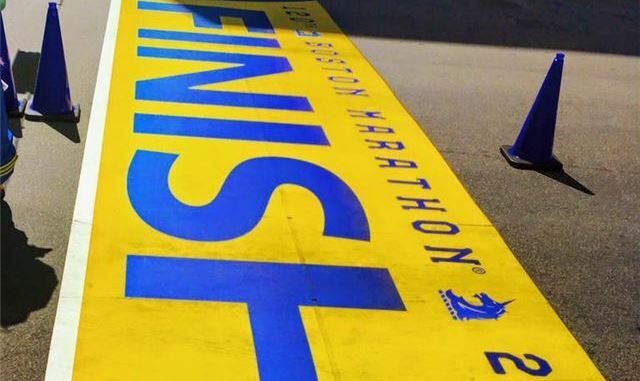 Even if you aren’t heading to the start line in Hopkinton, this is a premier event to get racing gear, hear from Boston Marathon celebs, and get ready for the modern world’s oldest marathon. After you get your bib, head to Seaport Provisions, our lobby gift shop, and get a 10% discount on all Boston Marathon items with your bib! •All-You-Can-Eat Pasta Buffet: TAMO may be perfect for a cocktail, but it’s also a great way to fuel up for all 26.2 miles. TAMO will offer a $24 all-you-can-eat pasta buffet in the TAMO Loft Sunday from 6pm to 8pm to fuel you up from Hopkinton all the way to Copley. Reserve your spot by dialing ext. 4304. Platters of fresh pastas, gluten-free options, and Caesar salad will certainly send you to a PR! •Grab ‘N Go Breakfast: On Marathon Monday, TAMO will feature a $10 Grab & Go Breakfast from 5-7am that can be pre-ordered by dialing ext. 4305. •Marathon Shuttles: Wave Health & Fitness will have a stretch/roll-out area on the Plaza Level for runners waiting for the Marathon shuttles. These two complimentary shuttles will run on a continuous loop to the official Hopkinton bus pick-up from 5:30am until 8:30am. We will have fresh fruit and water at the Plaza Level for runners to take with them. •Post-Marathon: Spratt Muscular Therapy will provide $40 shake-out massages from 4-7pm after the Marathon. Please contact Wave to set up an appointment for a soothing warm-down!